Asparagus Nutrition:Traditional Chinese Medicine Healing Properties? Asparagus Nutrition. In Traditional Chinese Medicine Asparagus the food has wonderful healing power...as does Asparagus Root is an herb with considerable healing power! Thermically (meaning it has a heating or cooling or neutral effect on the body's temperature): It is slightly warming...meaning it will warm your body from the inside out. Taste: Bitter and mildly pungent or spicy tasting. 1. Nourishes or increases Kidney Yin. Therefore it reduces menopause symptoms and other signs of Kidney Yin Deficiency. Beneficial therefore in the treatment of Diabetes. 2. Benefits the Lungs: A. Reduces phlegm and congestion in the lungs, B. Stops cough and bleeding, including coughing up blood tinged mucus from the lungs. C. Benefits chronic Bronchitis. 3. Benefits fertility and reduces menstrual difficulties. 4. Moistens Intestines and alleviates constipation...promotes bowel movements. 5. Removes fat and plaque from the arteries. Asparagus is an alkaline food. It is an excellent source of potassium, folic acid, vitamins A, C and K, and traces of vitamin B complex. 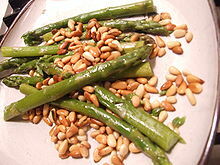 Asparagus is also rich in niacin, phosphorus and very low sodium. Asparagus is one of the few vegetables that actually has calcium and magnesium in the ideal ratio of 2:1. This is very important in keeping these electrolyte minerals in proper balance. Acidity: Highly Alkaline: The high alkalinity of this wonder vegetable is effective in reducing the acidity of the blood and helps cleanses cells and tissues and muscles of waste. Arthritis and Rheumatism: A unique phytochemical in asparagus that produces anti-inflammatory effect helps relieve arthritis and rheumatism and its pain. Blood Pressure Reducing: Lowers blood pressure in many cases. Constipation: Consume asparagus regularly for its mild laxative effect and dietary fiber that provides for regular bowel movement. Cancer: Asparagus is a prime source of the anti-oxidant glutathione that can help prevent cancer. Cataracts: The anti-oxidants and glutathione in asparagus prevents the progression of cataracts and other eye problems. Cholesterol Lowering...Reducing: Helps cleanse the arteries of Cholesterol and is beneficial in lowering blood pressure and reversing arteriosclerosis. Diabetes/Hypoglycemia: An important part of the diet for people who are controlling their blood sugar levels. However, it is not to be taken by people with advanced kidney diseases. Kidney Stones: The diuretic and alkaline properties of asparagus help prevent or dissolve kidney stones. It helps break up oxalic acid crystals formed in the kidney. Pregnancy...effects on Pregnant women: The high content of folic acid, calcium and other minerals in asparagus is important in reducing the risk of birth defects and low birth weight. The diuretic effect of the juice is also a big help in reducing water retention in pregnant women. To make asparagus juice more palatable or better tasting, you can for example mix with raw honey. Alternatively you can mix asparagus juice with other more palatable juices from spinach, celery, tomato or even lemon juice. When buying asparagus, choose straight, firm stalks with tight tips. Always eat fresh but if you won't be eating them the same day you buy them, keep them dry and tightly-wrapped in a plastic bag or plastic wrap and they will keep for up to three days in the refrigerator. When cooking asparagus, it is preferable to steam, rather than boiling them in water to cook them since steaming preserves the enzymes, vitamins, minerals and other nutritional factors from boiling away. In my experience it also tastes a lot better. You can butter it or drizzle it with first cold pressed olive oil. Eating too much Asparagus can irritate the Kidneys! Please click here to go to Holistic Nutrition Information.